Participate in environmental projects and activities to help restore healthy ecosystems on land and in the ocean such as Ocean Conservancy's International Coastal Clean up Day. 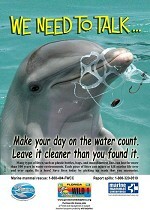 Participate in our Clean Ocean Dolphin Poster Project. Always be mindful of your trash – never litter! Trash can be deadly for wildlife. Even trash on city streets can get washed into storm drains then carried into streams, rivers, and the ocean. All along the way, plastic trash kills marine life and birds through ingestion or entanglement. Because plastic can last for many years in water environments, chances are that plastic debris will kill again and again. So be careful that your trash doesn't end up loose in the environment. Also, whenever possible, pick up litter – especially plastics – dropped by less intelligent people. Even though you might feel annoyed at having to clean up after others – the animals will thank you! And you can congratulate yourself for being the kind of person who makes our planet a better place. 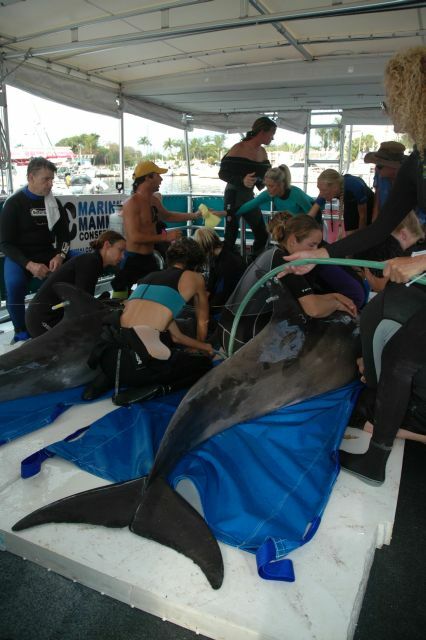 Volunteer at a marine mammal rescue organization! 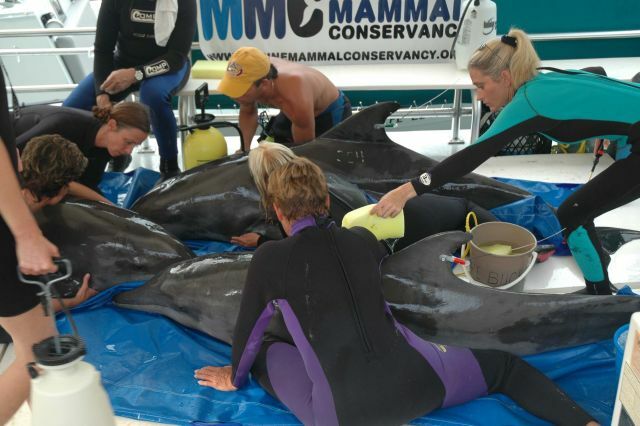 There are many such rescue organizations around the world and most of them depend on volunteers to help care for injured and stranded marine mammals. When a stranding happens, countless volunteers are needed around the clock to help the animal survive. People are needed to do everything from the mundane to the intense such as making phone calls and keeping the rescue site clean, to preparing food and medicine for the animal, as well as supporting the injured animal in the water. Many rescue organizations offer free training classes so that volunteers are well prepared when a stranding occurs and the team needs to spring into action. Also, by volunteering with a rescue organization, you will eventually have hands-on personal interaction with amazing marine mammals – often these are animals that you would normally never have the opportunity to meet. And you will be making a direct contribution to that animal's well being. By working with the Marine Mammal Conservancy in Key Largo, Florida (www.marinemammalconservancy.org) which rescues and rehabilitates stranded marine mammals, we have been blessed to know Rough-Tooth Dolphins, Pilot Whales, an adult Pygmy Sperm Whale, a neonate Sperm Whale, a rare Gervais Beaked Whale, a juvenile Spotted Dolphin, and an Offshore Atlantic Bottlenose Dolphin. Even in cases where stranded animals do not survive, volunteers are both empowered and comforted by knowing that they helped make that animal's transition more peaceful. 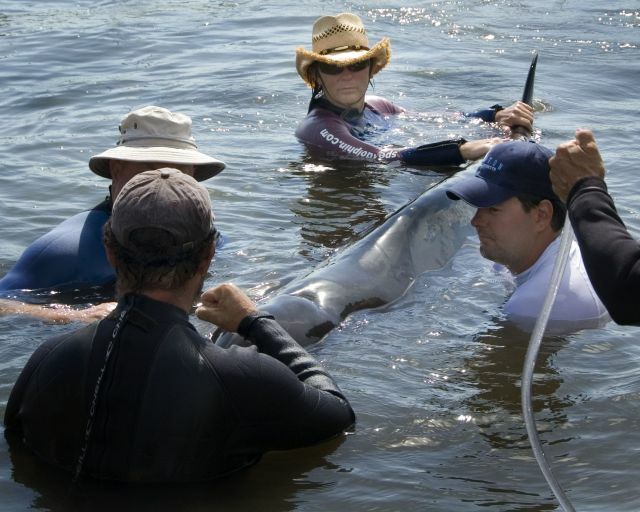 Your generous donations to our research will help us to significantly expand communication between dolphins and humans. Speak out against ocean pollution, unsustainable fishing practices, the slaughter of cetaceans (dolphins, porpoises and whales), and military use of any sounds that harm or disturb cetaceans.